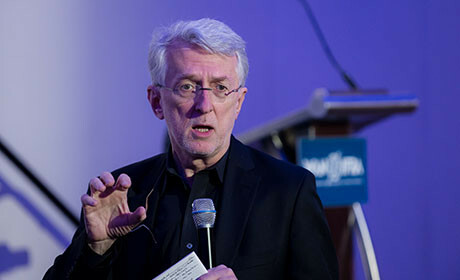 News organisations need to "rethink journalism away from being a content service and more toward the idea of being a service," according to Jeff Jarvis. Speaking at the World News Media Congress, Jarvis, of CUNY graduate school of journalism, said outlets should "know people as individuals, not as a mass" and tailor the news and experiences they offer accordingly. Jarvis's latest book, published on Medium, delves into this theory in more detail, stating: "Perhaps defining ourselves as content creators is a trap. "That workflow convinces us that our value is embodied entirely in what we make rather than in the good value people derive from it." The importance of a better understanding of the audience was a theme that cropped up throughout the conference in Washington DC. The New York Times' James Robinson revealed how the outlet is using Reddit to monitor discussions around NYT stories, while The Washington Post's Greg Barber spoke about his role on The Coral Project, an initiative to encourage new communities which are more targeted towards how people like to interact with each other. Jarvis cautioned against an over-reliance on traditional metrics as a measure of success, stating that "pageviews will lead to nothing but cats, and crap". "We've learned what BuzzFeed does," he said, "but we don't want to become BuzzFeed." Despite hiring credible journalists and beginning to offer serious news and investigative reporting, BuzzFeed is struggling to shake its reputation as the original pusher of listicles and cute animal pictures to attract high pageviews and social shares. At the same time, many news outlets have picked up on BuzzFeed's digital success, seeking to emulate some elements in their own style and voice. "And so we have to decide what we really are," continued Jarvis. "Because if we keep on going with volume, with the old media metrics, the mass media metrics of reach and frequency, transpired to our world in terms of pageviews and unique users, then we'll be commodified as a business." It is also important for news outlets to acknowledge they are "not alone", said Jarvis. It makes sense for outlets to work together through collaboration and curation, "sharing content and audiences" which could improve the scope of coverage and public service for everyone. In an increasingly crowded news space, all outlets have to find their niche. "No one can do everything, and you have to figure out what you do," he said. Jarvis said his most retweeted line ever is: "Cover what you do best and link to the rest". "If you're not the best at what you do – if you're the 20th best or the 30th best – don't bother doing it. And we have too much of that going on in this industry. We are a very inefficient industry." Jarvis also advised that news should not be broken up by medium, such as print, web and mobile, but by readers' needs, depending on their interest and how much time they have available. The real goal of the digital-first philosophy, he said, is for news outlets to become "fully sustainable digital enterprises, before print is unsustainable,"
Hear Jarvis give a few quick thoughts on the future of news below.